IF YOUR ENEMY¡¯S forces are united, Sun Tzu advised, separate them. Since taking power in January House Democrats have proved surprisingly united: discontent with Nancy Pelosi¡¯s speakership fizzled and the party successfully stared down President Donald Trump over his demand for $5.7bn for his border wall. But Republicans believe they have found an issue to split their opponents: Israel. And two new congresswomen, Rashida Tlaib and Ilhan Omar, are making their jobs easier. Ms Tlaib and Ms Omar are the first two Muslim women to be elected to Congress. Both support boycotting, sanctioning and divesting from Israel. Both have been attacked and derided for their faith. But both have also trafficked, wittingly or not, in anti-Semitic tropes. 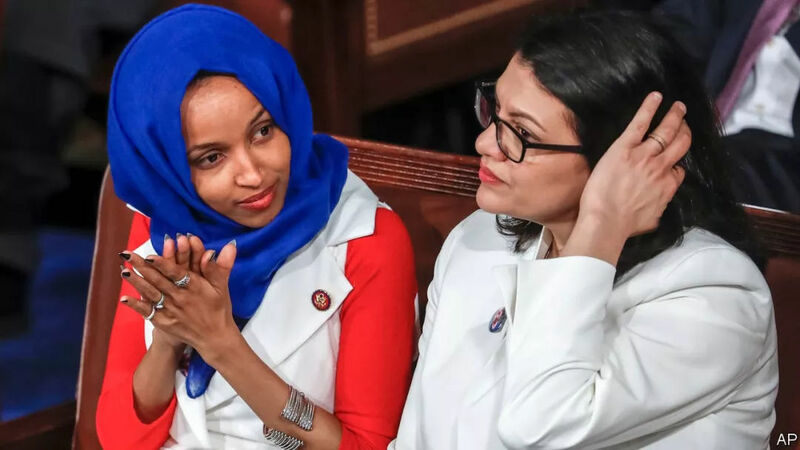 In January Ms Tlaib tweeted that backers of a bill that would allow states to forgo doing business with companies that boycott Israel have ¡°forgot which country they represent¡±¡ªevoking the pernicious myth of Jewish dual loyalty. On February 10th Ms Omar tweeted that American politicians¡¯ defence of Israel¡¯s government was ¡°all about the Benjamins¡± from AIPAC, the American Israel Public Affairs Committee, implying that they are controlled by Jewish money (¡°Benjamins¡± being slang for $100 bills, on which the great Benjamin Franklin appears). Ms Omar apologised, though stood by her criticism of AIPAC, after the House Democratic leadership condemned her remarks. Ms Tlaib said her comments were not aimed at Jews. Ms Omar¡¯s defenders on the left point out that AIPAC is indeed a fairly effective lobbying group. But there is a difference between arguing that AIPAC has a deleterious effect on American foreign policy, and claiming that American support of Israel is ¡°all about¡± money from Jewish lobbyists. Americans from both parties and many faiths reflexively support Israel¡¯s government for a variety of reasons. Kevin McCarthy, the top-ranking House Republican, had already accused both women of anti-Semitism, Ms Omar for a 2012 tweet that evoked stereotypes of Jewish manipulation by saying that ¡°Israel has hypnotised the world.¡± Liz Cheney, chairwoman of the House Republican conference, urged Democrats to remove Ms Omar from the House Foreign Affairs Committee, as has the Republican Jewish Committee. Mr Trump called on her to resign. Yet Ms Omar did not accuse Michael Bloomberg, Tom Steyer and George Soros (all Jews) of trying to buy the 2018 mid-term elections, as Mr McCarthy did. Nor did Ms Tlaib accuse a Jewish audience of wanting to ¡°control [their] politicians¡±, or release a campaign ad featuring three prominent Jews (Mr Soros, Lloyd Blankfein and Janet Yellen) who ¡°control the levers of power in Washington¡­[and] don¡¯t have your good in mind¡±, as Mr Trump did in 2016. Neither Mr Trump nor Mr McCarthy offered as thoughtful an apology for their words as Ms Omar did. It makes political sense for Republicans to foment dissent among Democrats: they are more divided over policy towards Israel than Republicans are. But if they were really concerned about anti-Semitism in American politics, they would look to the beam before the mote.